Located in central L.A. between Sunset and Hollywood Boulevard, our partner school occupies a stylish, modern building with lots of great outdoor space. Classrooms are bright and spacious with interactive whiteboards. There is a student lounge with a TV as well as a snack bar, coffee shop, kitchen and outdoor dining space. High-quality teaching with all the backing of Kings’ years of experience is reinforced with state-of-the-art learning facilities, which include a computer learning centre, free Wi-Fi throughout and an Apple Mac editing suite, used by students taking the highly popular English Plus Film course. There are additional state-of-the-art classrooms in a recently refurbished building a 2-minute walk away. Arrival transfer compulsory for arrivals from Monday to Saturday and for arrivals after 22:00 h on Sundays. Are you a cinema-addict? 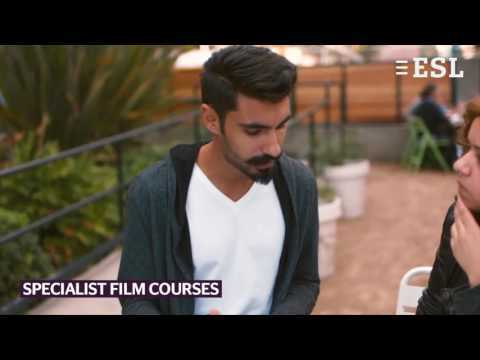 Learn English in Los Angeles, the world’s film capital! This English course will allow you to improve your language skills while studying script-writing, acting, contemporary film and production, as well as learning how to use professional digital editing software. Explore the film industry by meeting all the interesting guests invited by the school (actors, directors, etc.) and visit iconic film locations and studios. An exclusive programme for people of 25 years +, combining General English with English for professional communication in a globalized world. It also includes learning and cultural activities outside the classroom. Options: Business, culture, conversation, vocabulary builder, etc. Please note: ​The course material is lent for the duration of the programme, but you may purchase it on site. The things I love the most here are the teachers who are always open to help us and the location because there is a lot of things to do around Hollywood! Universal Studios! Griffith Park, Santa Monica and Venice Beach. I really like the fact of shooting a movie during class, I learned a lot of stuff and it is very interesting. After receiving a nice and professional advice from ESL, I decided to go to Kings College in Los Angeles, as the school is close to my residence. The school offers plenty of excursions, like for example Catalina Island or whale watching in New Port. The teaching method at school made me progress a lot. I had some gaps in writing, and my class focused exactly with that. Teachers were always very helpful and courses were varied. Los Angeles is a crazy city, with a very colourful population, but everyone is super nice and I don’t regret a single thing of my 3 weeks there – also because the weather was amazing! I chose LA for the nice weather and because I wanted to go to California. I spent a hectic month there, the city is very welcoming and the people very friendly. I made friends with other students right from the start. The school was really good and only 30 minutes’ walk from the residence. The teachers were very friendly and different to the ones in Europe. If I had to do it again, I would leave for LA but this time forever. LA is definitely full of surprises. Take advantage of your language study stay in Los Angeles to get familiar with the famous American way of life. Host families are selected with care by our partner school in some of the best residential areas in Los Angeles, normally around 60 minutes from the school by public transport. You'll stay in a single room or twin (available all year round if you're travelling with a friend, or to share with another international student during summer 23.06-17.08.2019), have breakfast and dinner with the family and share the common areas with the other family members. You’ll be able to do laundry once a week, and free Wi-Fi is guaranteed outside high season. Located in the heart of Hollywood, just 15-20 minutes’ walk from the school, this pleasant residential complex is exclusively for Kings’ students. There are many supermarkets and restaurants located nearby, as well as major movie theatres and lots of other famous Hollywood attractions within walking distance. The complex provides 24-hour surveillance and is located less than 10 minutes’ walk from Santa Monica Boulevard, which offers direct bus routes to the beaches on the Westside of Los Angeles. Bed linen and towels are provided and you’ll find onsite laundry facilities. Twin rooms in the residence: the residence offers modern and spacious twin rooms, each with an ensuite bathroom, equipped kitchenette, dining area, flat-screen TV, free Wi-Fi and air conditioning. You can relax in the communal recreation room and on the outside patio area of the residence. Single rooms in bungalows: you'll stay in a bungalow designed for single occupancy. Each bungalow has a private bathroom, equipped kitchenette, free Wi-Fi and air conditioning. Within the Kings Los Angeles campus, just steps from the classrooms and a subway station, this residence is as convenient as it is comfortable! You will stay in a twin room with desks and share the bathrooms, furnished kitchens, dining areas and spacious common area with the other guests. Bedlinen and towels are provided. For your convenience, the building is air-conditioned, Wi-Fi access is free and laundry facilities are available. This residence offers welcome independence to international students wishing to stay close to the school and in the very heart of Hollywood. If you stay in this stylish student residence in the heart of Hollywood, you’ll be walking distance from all the main attractions and a 20-minute walk from the school. Each apartment features single rooms (twin rooms are available on request) with shared bathroom and shared kitchen. Bed linen and towels are provided, laundry facilities are available onsite and the Wi-Fi is free. The residence has a nice outdoor eating area, a fitness and yoga room and two onsite restaurants – and it’s monitored 24/7! Bungalow - residence "La Mirada"
The bungalows of La Mirada Residence are located one block from Santa Monica Boulevard, which offers direct bus routes to the beaches on the Westside of Los Angeles. Plus it is only a 15-20 minute walk to Kings Colleges and all of the sights that the center of Hollywood offers, including the Walk of Fame, the historic Capitol Records Tower and movie theaters such as the Egyptian and the Mann Chinese. Students are also provided with a key to personal mailbox, so that they can receive regular mail. Students will be given a Inspection Form. There is a gated patio area for Kings students only. Room can accommodate single travelling student though this student would likely be placed with a roommate. In 2015, Kings Los Angeles (Hollywood) opened this brand new residence right next to the main school building. Located in the heart of Hollywood, between Hollywood and Sunset Boulevards, the residence is surrounded by several restaurants, cafes, clubs and bars, but you will also be close to high-end boutiques, to historic movie theatres and to the Dolby Theatre, where the Academy Awards are hosted. It is only a 5-minute walk to the Metro Red Line subway, which connects North Hollywood with Downtown Los Angeles. Available also for a single travelling student. Start by admiring the stars on the Walk of Fame, visit the wax museum, the Egyptian theatre or the Kodak Theatre, all within a 10-minute walk of our partner school! Multiplex cinemas show the latest creations from the American film industry. Savour dishes from the whole world in the great choice of trendy restaurants. Los Angeles is also a paradise for shoppers! If you like white sandy beaches and swimming in the sea, you’ll find what you’re looking for at L.A.’s magnificent beaches. The weekly social programme organised by our partner school taps into many of these attractions, with a whole host of activities in the exciting Hollywood area around the school itself as well as optional excursions on weekends. 368 students rated this school. See the testimonials of former students. For courses of 36 weeks and upwards, ESL offers you the return flight to Los Angeles free of charge. Valid for all enrolments at the KINGS school in Los Angeles.